Home organization can be an overwhelming task, especially when there are so many different storage dilemmas. If you're frantically searching for a way to perfectly store your clothes, shoes and other must-haves, don't stress! We've got plenty of storage solutions for you and we'll make sure your bathroom storage, shoe storage and closet storage is perfecto. Collect those small accessories in baskets and storage bins. If you have plenty of shelves but are lacking in drawers, create your own organizers by placing small items like belts, lotions and utensils in storage containers. You've got a wide variety of materials, styles and colors to choose from — including wicker, cloth and wire — so you can add pops of color or texture to make your closet fit perfectly with the rest of your home. 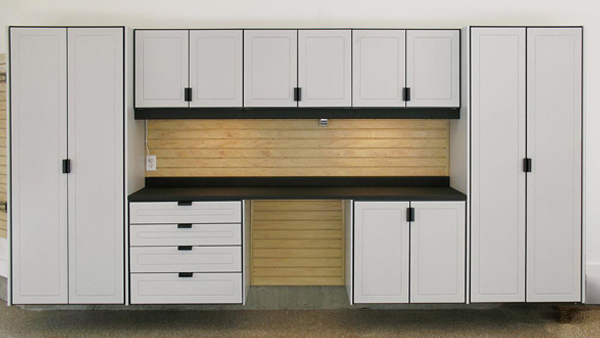 Similarly, plastic or wood drawer organizers give you a place for everything and keep everything in its place. If they slide around when you open the door, try adding Velcro dots to the bottoms of the organizer and drawer for an easy fix. Tackle those unruly fitted sheets. If you have open shelving or just like things to be extra tidy, hard-to-fold items like fitted sheets can be a real pain. Solve the problem of unruly folded sheets and keep your sheet sets organized by folding them up and tucking them into a matching pillowcase. Voila! No more droopy corners hanging out, and every piece is neatly stored together. Corral clothes with shelf dividers. Don't let that pile of sweaters or towels get out of hand. Plastic or metal shelf dividers are an easy, space-efficient way to designate specific spots for your sweaters, towels and even handbags. Best of all, they're easily repositionable so if you overhaul your closet or shelf organization scheme, you won't have to worry about unscrewing or unhooking these helpful pieces. Utilize the space under your bed. Whether you've invested in a bed frame that includes storage or if you're opting for the less expensive option of plastic bins, underbed organizers are a great place for seasonal clothing, extra comforters, boots and even holiday decor. If you like to DIY and have some unused drawers available, try attaching casters to two or three drawers.